We arrived at Ballycastle about 3 o'clock, fully prepared to do justice to our dinner. The town of Ballycastle consists of two parts, upper and lower. The lower is called the Quay, and the two were joined together by a fine avenue of trees, but during the last few years a good class of boarding houses and family residences have been built by the roadside, thus connecting the two parts of the town. There is a good supply of hotels and boarding houses, and there are many objects of interest within easy reach of Ballycastle. Walking along the cliffs above the quay you have a fine view of Fair Head and the Scottish coast, and in the front, only a few miles distant, is Rathlin Island. Some of our party decided to spend the evening on the headland overlooking the sea, and in the town. Others decided to engage cars and drive as far as Fair Head and Murlough Bay, following the advice of Mrs. Hall, who said, "Let the visitor on no account omit to inspect this bay, a scene of unspeakable splendour and beauty." Again the fair writer says of Fair Head and Grey Man's Path—" It is impossible for any description to afford an idea of its surpassing grandeur. Standing upon the brink of one of the high precipices of which it is composed, the prospect was so terrific as to have been appalling. A rapid glance was sufficient to satisfy our curiosity. We shrank back with natural dread, for dizzy 'tis to cast one's eyes below.'" On going to Fair Head we had to return by the road we came to Ballyvoy. Then after going some distance to the left, passing some miners' cottages, we left our cars and proceeded on foot over the mountain top in charge of a boy we engaged as guide. We passed on our way two small tarns or lakes, one of which had a small island in the middle. The boy was prepared to tell us any amount of legends about these lakes, but we wanted to get to Fair Head, as we had not much time. ​I shall not attempt to describe the view from here. Read the full description of it in the books of Mrs. Hall and other writers. After spending some time here we went forward to Murlough Bay, which well deserves all that has been written about it. We were sorry we could not spend more time here, but for fear that it would be dark before we got back to Ballycastle, we soon joined our cars which had come round to meet us. When we returned, we told our friends what a treat they had missed. After spending a very pleasant night and the early part of Wednesday morning in and around Ballycastle, at 10 o'clock we again proceeded forward by road to the Giant's Causeway, a distance of 13 miles. For some distance there was nothing of special interest. We had a good view of Rathlin Island, and the driver told us many legends of the time of Bruce, of Scotland, and how King Robert and his brother made Rathlin Island their home. We left Kenbaan Head on our right, a white limestone headland running right out into the sea, and crowned by the ruins of Kenbaan Castle. Before we came to the village of Ballintoy, we left the coaches to visit the Rope Bridge of Carrick-a-Rede, or the Rock on the Road. This rock is separated from the mainland by about 60 or 70 feet of a chasm, and is connected by this curious rope bridge. The bridge is used by the fishermen engaged in salmon fishing, and it is only up during the summer months, when it forms an object of interest to all visitors. Only the most daring venture to cross by it, though the fishermen constantly carry heavy burdens across with the greatest ease. There were only a few of our party who would make the attempt. One was a lady. I went across first, she followed me, and then several others came over. Some when they felt the bridge swinging were glad to return. To anyone with a steady nerve it is not nearly so dangerous as it seems at first glance. The bridge is formed of two strong, ropes or cables stretched from the mainland to the island and fastened to iron rings, which are firmly secured in the rocks on each side. The ropes are about 30 inches apart, and connected by short pieces of wood tied with cord to the ropes on each side, and on the top of these cross-pieces boards are laid and fastened down by cord. A smaller rope runs across the chasm about three feet above the bridge to act as a guide rope, but weight must not be placed upon it. When anyone is crossing, the bridge begins to swing, and I can understand persons being dizzy if they look down into the water, a distance of 80 feet, but if they look across it becomes quite easy. After spending a short time at the bridge, we joined our coaches at the village of Ballintoy, and soon came in sight of White Park Bay and the old castle of Dunseverick. Then passing the schoolhouse and village, we soon came to the Royal Hotel, Giant's Causeway, all of us pleased to get seated at Mrs. Kane's hospitable board. 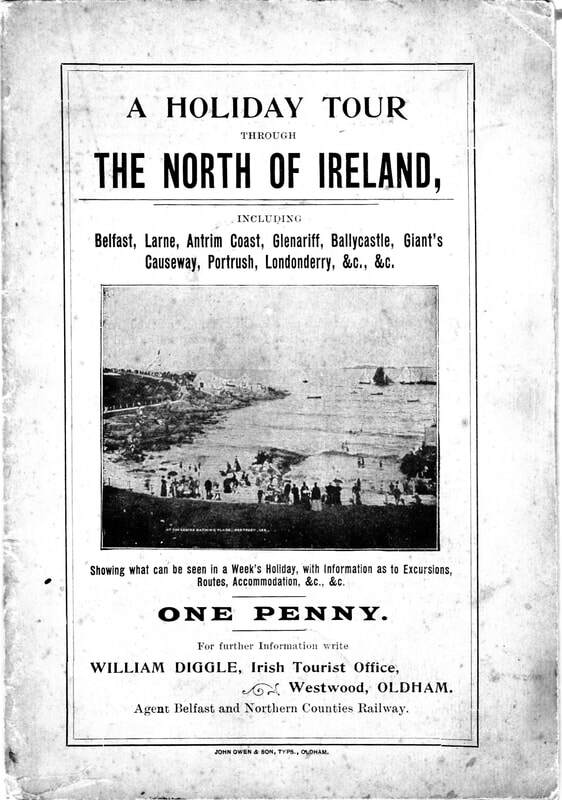 There are two hotels at the Giant's Causeway, viz., The Causeway Hotel, connected with the Electric Tram Company, and Mrs. Kane's Royal Hotel, both of which are large and comfortable.